Christianity Today 2019 Book of the Year Award, Fiction The women of Sensible Shoes are navigating both deep joy and devastating loss. Can they find equilibrium in the midst of all that has changed? Mara: While faced with the turmoil of divorce and chaos at home, she is also listening for a call to serve others with courage and creativity. Hannah: As she grieves the twin losses of her dear friend and her Chicago ministry position, she also begins to embrace the joys and challenges of a new marriage. Charissa: Overwhelmed by her pregnancy and the demands of her teaching schedule, she is in need of even more grace for herself and others. Becca: Bereft and filled with regrets, can she find hope for the future and a way home? In this final installment of the Sensible Shoes series, you're invited to travel with these beloved friends as they endure trials that test their trust and their willingness to walk an extra mile. 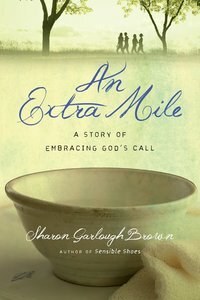 About "An Extra Mile (#04 in Sensible Shoes Series)"
Sharon Garlough Brown is a spiritual director and cofounder of Abiding Way Ministries, providing spiritual formation retreats and resources. Her book Sensible Shoes was named one of television personality Kathie Lee Gifford's "favorite things" in March 2013. Sharon earned an MDiv from Princeton Theological Seminary. She and her husband, Jack, have served congregations in Scotland, Oklahoma, England, and West Michigan. The women of Sensible Shoes are navigating both deep joy and devastating loss. Can they find equilibrium in the midst of all that has changed? Mara: While faced with the turmoil of divorce and chaos at home, she is also listening for a call to serve others with courage and creativity. Hannah: As she grieves the twin losses of her dear friend and her Chicago ministry position, she also begins to embrace the joys and challenges of a new marriage. Charissa: Overwhelmed by her pregnancy and the demands of her teaching schedule, she is in need of even more grace for herself and others. Becca: Bereft and filled with regrets, can she find hope for the future and a way home? In this final installment of the Sensible Shoes series, you're invited to travel with these beloved friends as they endure trials that test their trust and their willingness to walk an extra mile. Having been challenged to persevere in hope, can the women of the Sensible Shoes Club now embrace the joy of complete surrender? Join Mara, Hannah, and Charissa in a poignant tale about what happens when we lay our messy lives at the feet of God, and stand barefoot on holy ground.